While I briefly wrote about this project in earlier posts (projects in countries), I realized that I had not written a full account of the activities that had transpired. Thank you to all who supported the shoe drive. It’s a matter of food or footwear for thousands of people around the world. A choice must be made between putting food on the table and buying a pair of shoes. This is especially true in many areas of Kenya and Uganda. Living in poverty means having to think about the difference between ‘wants’ and ‘needs’. To most of us, shoes are a basic need to protect oneself from the harsh environment which could lead to foot diseases and other long-term effects on the body, but to others, the need for shoes is not a priority. 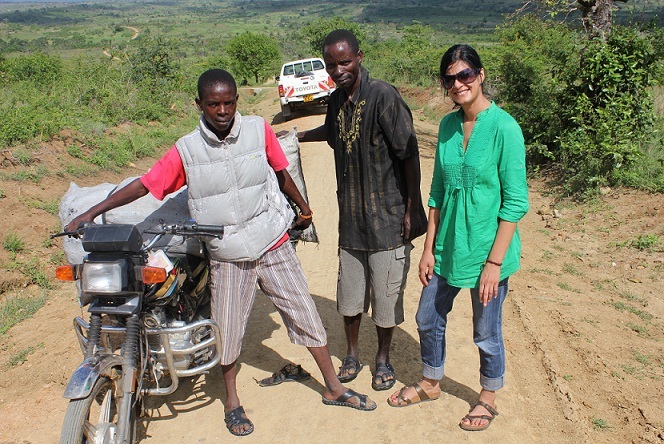 My colleague and I drove through the bumpy, dirt roads within the Kinango and Kwale districts, just outside of Mombasa, on a day trip to the field. We were heading to 3 villages that day, in order to learn more about an early grade reading initiative that we were both involved in. Along the way, I witnessed numerous individuals – men, women and children – without any shoes. I had travelled to many remote villages in several countries before but this was the first time that I had noticed a great number of shoeless people. I asked my colleague if there was another reason, other than not having enough money to afford a pair, but in the end, it came down to affordability. Later that same evening, I wondered how feasible it was to provide people in Kinango and Kwale with a pair of shoes that were good enough to protect them while they walked the several miles that they did each day. Sometimes, as foreigners we think that our ideas make sense and perhaps what we view as simple solutions, may not be really simple at all. I woke up the next morning, with the same thoughts that I had fallen asleep to the night before. When my colleague picked me up the next day in the company pick-up truck, I buckled myself in and before he could even ask me how my evening was, I was already sharing my most recent idea with him. Growing up and working in Kenya gave him a better sense of the cultural nuances in those areas. The idea was well received by him, and by the end of the day, I had a better sense of what to do. I plugged in my Safaricom modem and sent a message out to friends in different parts of the world. I provided them with a brief background on how the idea came about and informed them that I was prepared to hand deliver the shoes to people in Kinango and Kwale myself. I requested that people give donations so that I could purchase the shoes locally. The response was delightful. Donations continued to flow in over the next 2 weeks. This is how the Kiatu/Amukat (Shoe) Project began. I was based in Mombasa town while on this particular trip, and through my conversations with my colleague, I had already identified areas in which I could purchase shoes for our shoe drive. There were several independent shoemakers lined up in the narrow alleyways throughout the city centre. Flat shoes seemed the most sensible to distribute, but not all that I tried on, felt comfortable. I bought a few pairs from those vendors during my first afternoon of shoe buying. The following day I ventured to some smaller, independent stores but they had a very limited selection of flat shoes for women, and the shoes for men seemed too dressy. I came across shoes for children that were reasonably priced but they were made with a plastic-type material and so I opted to buy only a few pairs to test them out first. As the days passed, I realized that it was more difficult to find comfortable shoes at a price point which would allow for the purchase of many pairs. And while my intention was to support independent shoemakers, this proved to be somewhat difficult. I had to go into a larger retail store. Here, I was able to find shoes for the whole family. They felt comfortable and looked like they would last a long time. I decided to buy a hundred pairs, in various colours, styles and sizes. As we drove back through the familiar territory of Kinango the following week, my colleague and I paid attention to people’s feet. We had come up with a strategy the day before. Since my colleague speaks Swahili, he would do most of the talking, as my Swahili would probably scare people off even before they tried the shoes on! This way, people would feel more comfortable and open to speaking in a language more familiar to them. A young lady wearing a colourful Kitenge, balancing a large sack on her head looked into the pick-up as we slowed down to get her attention. She walked up to the passenger side where my colleague had been seated. After some light conversation, which I could barely understand, my colleague asked her in English where her shoes were. She giggled as she looked down at her feet. She was not the only one who found our questions amusing. This reaction was shared by many people along the journey. Perhaps they felt it was absurd for strangers to be asking them about their shoe whereabouts? Maybe it made them a bit uncomfortable? A few people told us that they had left them at home, finding it easier to work in the fields barefoot. But most of the responses we received were consistent with the fact that they could not afford them. We never indicated ahead of time that we were handing out shoes, so the responses all seemed genuine. The next question my colleague asked the young lady was ‘would you like a pair?’ She stared at him, wide eyed, but speechless. My colleague repeated the question, ‘would you like a pair of shoes?’ This time she nodded but looked away and giggled softly. I hopped out of the truck, pulled out one of the boxes that we had piled the shoes in, and assessed her foot size as I began to pull out a couple of pairs for her to try on. The first pair that she tried on fit perfectly. She had the most beautiful giggle and seemed truly happy. She thanked us and we said bye to her, without any other explanation, other than my colleague telling her that she should wear them and not worry about them getting dirty. They were there to protect her feet. Our method of stopping people elicited many different reactions along the way in both Kinango and Kwale. Some people were confused and didn’t know how to respond to my colleague when he asked them about their shoe situation, so they just kept quiet. Others explained how they did not have any money on them to pay us if we were to give them a pair. We even had one elderly man ask us what we wanted in return. But many just smiled and said yes, they wanted some shoes! We came across two young boys that were so excited, they said they were going to run all the way home in their new shoes. The smiles were contagious and the laughter that echoed out of the many joyful people, were priceless. The hugs and high fives that were exchanged gave me a certain sense of happiness. A few days later my colleague and I headed to Uganda. We were able to find suitable shoes in the local market. The reactions were nearly the same as in Kenya when we stopped people. One woman danced and sang in the middle of the road, wishing us well and promising to pray for us. The most interesting run in was with a boy, around the age of 14, selling women’s shoes on the street. He himself, was not wearing any shoes! He was most delighted when we offered him a pair of new sandals and told him that he was not to sell them! Our final pair was left in the middle of one of the narrow but never ending dirt roads. We hoped that someone lucky would walk by and find a small surprise, making his or her day a happier one. We did learn a few things along the way. It was interesting to note that there were many more women that did not own a pair of shoes, compared to men, especially in Uganda. Women’s feet were bigger than I had anticipated and so during our first drop off in Kenya, we had many small sizes that did not fit and could only offer men’s shoes to a few, which most women were happy with. Two ladies shared their concerns that their husbands would take the shoes away from them once they got home. In some villages, people did not speak the official language and on a couple of occasions, communicating was difficult. But in the end, the conversation was somehow understood. It is easy to brighten somebody else’s day with something so small, like a pair of shoes – something that we take for granted. Of course, this does not solve the larger issue of poverty, but at least it will provide some protection to the feet and support to the body, as people set forth for their day’s activities, which for many includes walking miles and miles. My colleague continued purchasing and distributing shoes long after I had left Kenya. Perhaps the next time I am back visiting those same villages, I will see more souls with soles.